While finishing up his university degree in Business Science, Fabrizio discovered his passion for building websites and joined Treehouse to build and sharpen his skills. Soon he was hooked, dedicating up to 8 hours a day to learning. Once he built up his confidence, Fabrizio started taking on client projects, and shortly after landed a job for a local freelance company. 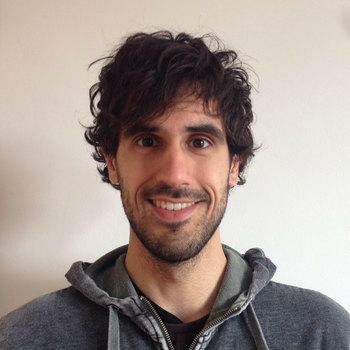 When an opportunity then presented itself to move to the Netherlands, Fabrizio was able to quickly landed himself a job as a developer at a web agency. Today, Fabrizio is growing rapidly into his role and embracing all of the learning opportunities he encounters along the way. Treehouse basically made me realise that rapidly changing my professional path was possible. It was actually a friend of mine. I was studying Business Science while he was developing websites and having a lot of fun doing it. So I started doing the same things on my own, asking him for some advice and eventually his passion completely infected me. He helped me a lot in getting started and also suggested I try Treehouse. I was finishing my studies at University and Treehouse looked quite promising as it was offering everything I could ask for at the time. Plus I had the free trial to test. What more could I have needed for encouragement? You're now a Full Stack Developer. Tell us a little bit about how your career has evolved since learning with Treehouse. Just after discovering Treehouse I was sucked into it and studied for something like 8 hours a day. As I become more and more confident with my skills I started looking around for some client projects and eventually managed to land a freelance job for a company in my town. It was quite a big job at that time. I updated their website with news and new pages plus I made it totally dynamic and built a small CMS in PHP from scratch. From there I moved onto helping a local party to build their own website for the elections they were taking part in. Then my girlfriend moved to the Netherlands and I decided to look for a job there and within two weeks of researching online I landed a job as a web developer in the company I am still working for today. It’s a web agency based really close to Amsterdam with big clients, so I’ve been able to grow a lot here. After almost a year, I started working for one of their biggest clients as an external Python consultant and developer. My plan for the future is to constantly improve my coding skills but also build some software that can help a lot of people. I want to find something that will really matter. I want a problem that can be solved by automating processes. A lot has been already invented, but a lot is still waiting to be done. I am just looking forward to finding the right problem… in order to solve it efficiently. I am not looking forward building a startup out of it. It is the whole process that I care about. I’d also like to build a game (actually I am already doing something similar as the consulting work I am doing has a lot to do with helping the company deliver an innovative 3D game built with Unity). Still, I need more people than just myself for this. The only advice I can give new students is also the name of a famous song: don't stop believing. If you really want it. Don't do it for the money.